The internet is often a place of wonder. Anything a person could possibly want to know is no more than a few keystrokes away. I’ve learned more about computers, science, technology, and the nature of things than any school was able to instill in me as a child, and for that I’m grateful. However, the internet is also full of awful, mind searing phenomenon. If you’ve ever wanted to see a person puke paint or jam a mason jar up their nether region, then you’re in luck. 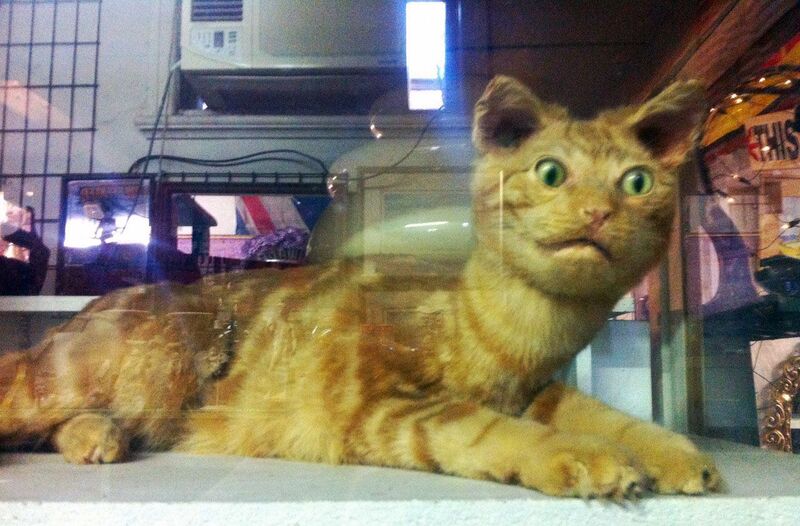 If you’re interested in seeing some of the worst taxidermy work in the history of taxidermy, well… you’re in luck there too. You see, a few days ago I stumbled onto a Tumblr page that I immediately thought was fake. It was full of the images you’re about to see, and my mind immediately recoiled at the terrible creatures I saw. Once majestic animals turned into creepy, wooden creatures with mangled, Picaso like faces doing completely unnatural things. There’s one fox in particular that will forever haunt your nightmares. That much I promise. 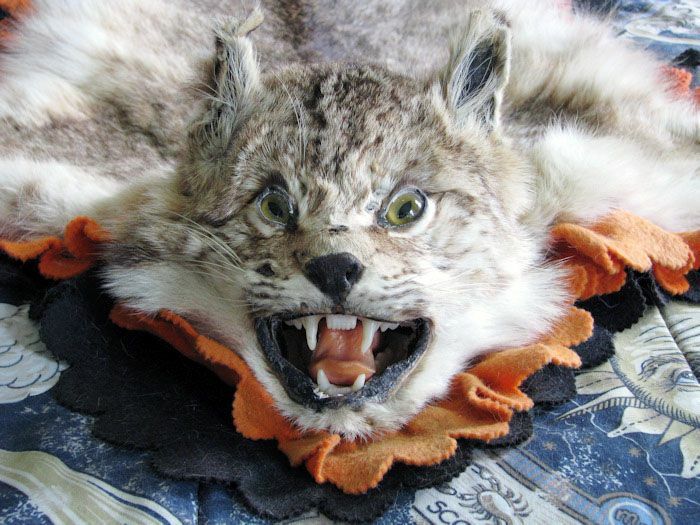 What person wouldn’t want to step out of bed in the morning to find this ferocious feline hissing at them? Its evil face, forever frozen in time, will never fail to induce pants shitting for the bleary eyed waking up after a restful slumber. It seems these cool cats took the exact same drugs that our friend above took, just moments before kicking the bucket. They’re either extremely excited, very high, or a combination of the two. Munchies, anyone? I… I don’t even know. 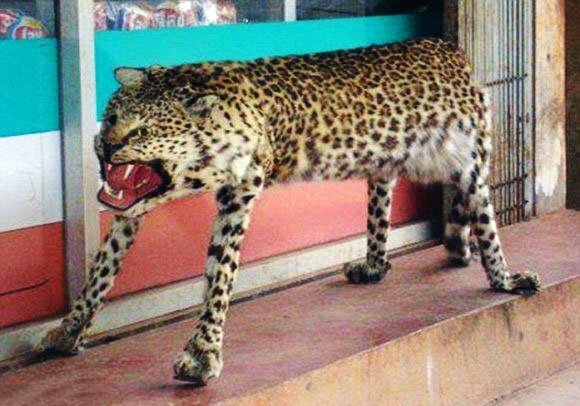 Just in case you’re wondering, yes… this is supposed to be a cheetah. I realize that may seem like a bit of a stretch, but just trust me on this one. Its running days are over, but it sure makes for an excellent foot stool! This has got to be the saddest otter I’ve ever seen, dead or alive. Once again, what person would want this to adorn any part of their home? Do the owners lock it away, only to bring it out when they feel the need to cry themselves to sleep? So… many… drugs. This picture is almost making me hallucinate just looking at it! This is the fantastic fox that I mentioned earlier. If ever there excited a murder fox, this would be it. Deep in sleep, tucked into your warm bed, the murder fox slowly creeping forward, one paw at a time, just waiting to plunge it’s massive blade into your uvula. I wanted to end this motley collection on a happy note. This is by far the jolliest dead lion I’ve ever gazed upon. I mean sure, its face may be mangled, and its tongue may look like an overcooked piece of tenderloin, but you know… can’t have it all. If you haven’t quite gotten your fix yet, then we’ve got just the place for you. In fact, we’ve got two… starting with the famed Orville Copter that Gina wrote about a few months ago, followed my the mother load – the Tumblr I mentioned earlier that’s absolutely full of user submitted, terrible taxidermy. You’ll be both entertained and horrified for hours. Haha that cheetah got me in stitches! 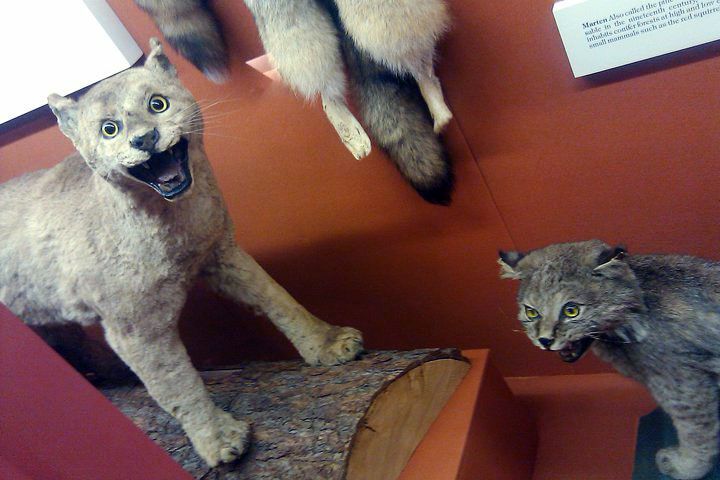 Man, I love these crappy taxidermy creations, especially that sad otter! I’ve had him on my desktop for so long now, he just reminds me of all injustice in the world. No matter how sad I am, i’ll never be able to reach the level of sadness that Sad Otter carries each and every day, for he can not change his facial expression. He is an taxidermy otter. 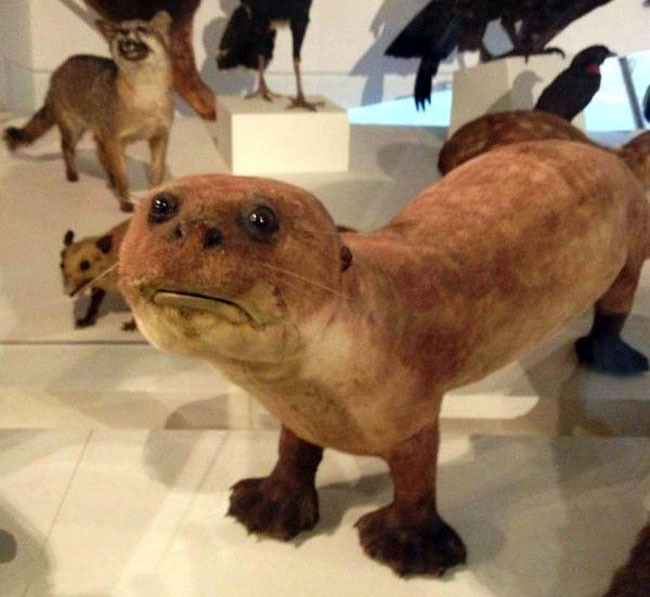 The sad otter is my favorite too, at least as far as creepy taxidermy animals go. I sometimes fantasize about getting a fake sad odder and putting it in my bathroom before guests come over. so funny and yet sooo disturbing.